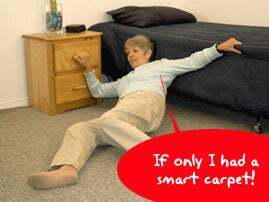 Yes, the Life Alert slogan is cliche, but how can you avoid it when talking about a "smart carpet" that can assist the elderly when they fall? The carpet is the brainchild of researchers at the University of Missouri, and it has the capability to electronically monitor a senior's location and sound an alert in the event of a fall. This is made possible using a new sensor that can be printed on thin, flexible sheets using equally flexible and inexpensive "organic ink."